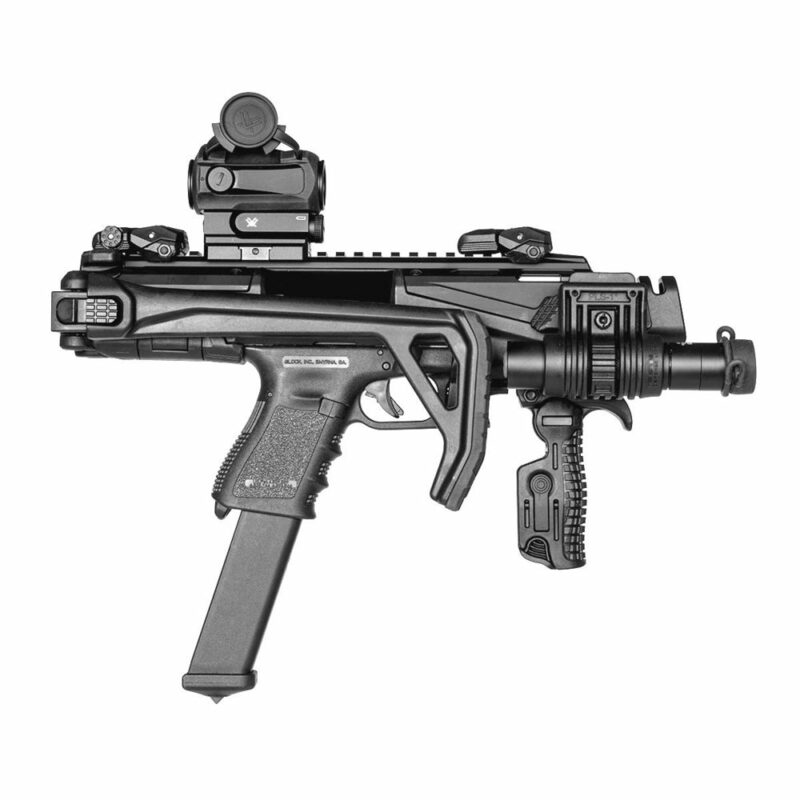 FAB Defense KPOS Scout Conversion Kit for Glock | Free Magazine Clip! We are proud to offer the brand new KPOS Scout for Glock 17, 19, 22, 23, 25, 31, 32 / Gen 3 – 5 including ‘C’ Models. The KPOS Scout is a true game-changer in the world of PDW conversion kits as it is both constructed from high-density polymer and aluminum. Making the KPOS Scout the only such variant on the market. This conversion kit comes in two different variations, the basic kit, and the pro kit. KPOS Scout Basic Kit: includes the KPOS body, foregrip, sling swivel and bungee sling. KPOS Scout Pro: comes with the FAB RBS FBS flip-up sights, range bag, foregrip, sling swivel and bungee sling. For the USA market, FAB Defense has produced a none NFA version that comes with a brace stock called the Sling Shot and an angled support under the rail. This qualifies the KPOS as none NFA, meaning it does not need to be registered, meaning NO extra paperwork and NO wait time. Be advised these are for Pre-order ONLY at the moment. We at Zahal carry the Entire KPOS Selection offered by FAB Defense. The models include the original KPOS G1, the KPOS g2 and the brand new KPOS Scout with all the accessories that are available for the KPOS including the None NFA KPOS Scout “Sling Shot”. The accessories comprise of different stock options for the KPOS G2, flip-up sights, bungee slings, range bags and much more. When buying a KPOS Scout Kit from us you get a FREE Glock magazine clip!! Excellent pistol conversion kit platform. Fits the Gen 4 G19 perfectly. Absolutely love the simplicity of use and versatility it adds to your weapon. Does Glock34-Gen4 fit for the Kpos-Scout as well ? is it compatible with a Glock17 Threaded ? Does the snout disassemble to accommodate a silencer ? If yes, what is the maximum diameter of the silencer ? The Scout will not accept a silencer on a regular barrel, you will need a 6″barrel at least in order to clear the main body of the Scout after the flash hider has been removed. What is the Length and Weight (in Pounds not in metric measurement) of the KPOS Scout magazine loaded and unloaded? Shoots great and gives another fun dimension to my Glock. Highly recommended! I have a glock19-generation 2. If I use a Recover Tactical Rail for the gun, can I use FAB Defense KPOS Scout Conversion? Is it compatible with the 19x ? Yes, the brace version is. I write from Bolivia, I`d like to buy yours products, I am owner manager of a company dedicated to the import of game weapons and their accessories… Could you send a cotizacion del kit FAB Defense KPOS Scout Conversion Kit for Glock 17/19 in 100 units. Please provide us with an email so we can contact you. Or email us at info@zahal.org and we will get back to you. When will be the kpos scout non-nfa be available in the US? Is the scout compatible with an HK .40 compact? If no do you plan on producing platforms for HK guns? At the moment FAB Defense does not make it. We hope to offer it in the future. Would love to see you make this for the Glock 20 10mm. Reside in the Pacific Northwest where black bears and grizzly bears are prolific. The hard cast rounds are touted as fairly effective bear defense loads. The 10mm has recently been referred to as the new .44 mag. In reality, probably not, however, there have been many reports of grizzly’s being killed with the 10mm. One could effectively employ fast and accurate followup shots on a charging bruin. I know that you’d have a big following with outdoorsman and survivalists wanting to pack in a small, compact, light-weight, weapon system that offers enhanced accuracy and controllability. My wife was nervous with recoil after using a 357mag at an indoor range but I convinced to try my G17 in the G2 chassis , the first few rounds she was nervous , but ended up running it all day and loved it . Wish I’d bought 2 now …..
Will my Glock17 Gen3 (using the normal length slide) together with a longer 6″barrel (Glock 17L barrel) fit into the Scout. Can I mount it into the kit w/o problems? Would be cool to know. Is this legal for delivery to the Philippines? If the NON NFA KPOS SCOUT “SLINGSHOT” is still on pre order. How many days of waiting before shipping in the United States? Why the model for the Glock 18 is included in the list or option where the Glock 19 apears and not where the Glock 17 is listed?? I am intererested in the model that fits the Glock 18 and the selection got me confused. When are the KPOS Scout with Brace going to be shipping? Will polymer 80 work with the KPOS Scout? Could I order this for California with no issue? ?i have a G17 G4, will this fit?? Thank you really looking to buy one immediately! Do you deliver kpos scout via dhl or fedex straight to my residential address (Philippines)? Do you have already a distributor in the Philippines? Shalom Zahal. All I want for Christmas is my Sling Shot brace and free magazine clip. Any chance that this might happen? 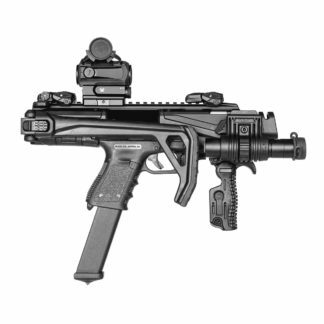 will the kpos scout w/ brace work with the new glock 9mm. G45? We hope to offer it in the Future. We have the KPOS G2 that will work. KPOS Scout- I truly love this weapon base. It is awesome to have a weapon in Police work that has a pistol round instead of a rifle round, yet performs like a rifle. Excellent for room clearing as well as other tasks. I highly recommend this for everyone who wants to zero in on your target. Will the Scout work with a G17 fitted with aftermarket LPA target sights? I know by other manufactures it wont due to the rear sight being slightly larger than the stock Glock sight. Looks amazing. 3 questions: 1) how do you preorder the non nfa version 2) will it fit the G45 Gen 5 (since it fits a 19X I would assume it does) and 3) do you have a price point for the non nfa version? Thank you and stay froggy my friends. If it does not change the frame of the Glock 25 it will work with the Scout. Is kpos scout compatible with full auto switches like these two models on the link pictures? Will the KPOS Scout fit a Glock Polymer 80 frame with the picatinny rail? Thanks! Is it possible to order it to sweden whit no problems? Guys, really when is the non-NFA brace arriving? Some guys have been waiting since Shot Show 2018. I won’t buy one until it comes off pre-order. hello ,y have a Glock17 Threaded , is it compatible with the kpos scout ?